If Cameroon want to stay in the World Cup they must beat Croatia tonight and they would have to do that without their Captain Samuel Eto’o who is struggling with a knee problem. Head coach Volker Finke has picked his men for the battle of Manaus in what looks like 4-3-3. Charles Itandje returns as goalkeeper; Aurelien Chedjou and Nicolas Nkoulou would apparently remain as a the centre back partnership. Stephane Mbia drops from midfield to field the right back position while Benoit Assou-Ekotto stays at left back. Joel Matip comes in to play as the sweeper in front of the defence. Many had expected to see the Shalke man in central defence with Nkoulou but it seems Finke wants to use his passing in midfield. The German-born manager’s midfield stalwarts: Enoh Eyong and Alex Song return. Will they have the creativity Cameroon needs in midfield to link defense and attack? The mouth watering prospect, though, will be the opportunity to see the future Cameroon attack line. For the first time in a World Cup game since 2002, Samuel Eto’o will not be featuring in the Lions’ starting line up. In his place, the young Vincent Aboubakar has the task of leading the forward line. Flanking the former Cotonsport Garoua striker we’ll have the talented Eric Maxim. Choupo Moting and Benjamin Moukandjo. No matter the players selected, what’s most important is whether Finke will allow the team to go forward rather than wait for their opponents. As expected Cameroon went into their game with Mexico looking like a 4-3-3 on paper and setting up in a 4-5-1 formation on the pitch. 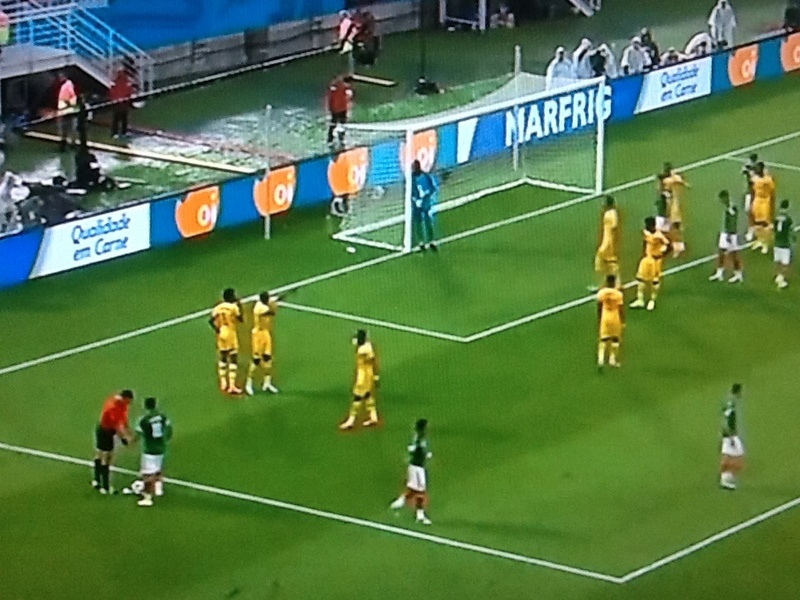 Cameroon defending a free-kick versus Mexico. Did their game plan show too much respect for Mexico? 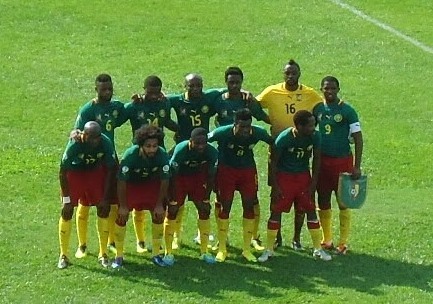 The starting eleven: Charles Itanje (GK); Cedric Djeugoue – Nicolas N’Koulou – Aurelien Chedjou – Benoit AssouEkotto; Stephane Mbia – Alex Song – Enoh Eyong; Benjamin Moukandjo -Samuel Eto’o – Eric ChoupoMoting. Their plan involved playing with a high defensive line (catch the Mexicans on offside), allow them keep the ball but pressure and block the spaces. It kind of paid off as it conned the match officials twice (they disallowed to valid goals on the grounds of offside). As expected the wide forwards/midfielders dropped very deep to keep up with the Mexican wing-backs to prevent them from overwhelming the Cameroon fullbacks. The challenge here is that they were always so deep that they looked like fullbacks. At which point Mexico’s 3-5-2 formation choked Cameroon. With everyone hemmed in with the Cameroon half, only Samuel Eto’o was left in the forward line where he was scrutinized by the three centre backs at all times. It was therefore hard to break swiftly and when this happened there was no support for the lone striker. In the second half the Mexicans increased interplay centrally and hit penetrative balls and runs through the centre and in behind Cameroon’s slow centrebacks. That’s how they scored their lone and game winning goal (1-0). 2. Change tactics and animation ie bring in a more direct forward and ask the team to wrest possession from the Mexicans in the way the Lions did when they went behind to Germany. He chose option 1. This meant the team did not move into third gear until late in the game when Webo was fielded and Cameroon switched to 4-4-2. It was a little late in my opinion. There was no punch, little movement while the build up was slow. With The lions absolutely requiring a positive result versus Croatia to keep their hopes alive, will Finke take a more open option? It’s time for the Indomitable Lions of Cameroon to talk on the pitch. In a few hours they will be facing the El Tri of Mexico. What should fans expect from the current pack of Lions? Head coach Volker Finke has mainly used a 4-3-3 formation since he took over. However, there have been games where the Lions played more as a 4-2-3-1 with a double-pivot in central midfield and, in at least one instance their shape was close to a 4-4-2 diamond. I expect the Lions to show up as a tight unit in a 4-3-3 when attacking and 4-5-1 once they lose possession of the ball. The latter would be the default posture taken by the team which will be very defensive in outlook. The central midfield trio will look to charge down on the Mexicans, with a lot of energy to disrupt their movement. When in 4-3-3 mode the forwards will bear down on Mexico’s central defensive trio. When the ball is lost the wide forwards will drop into midfield to block the flanks and serve as the first line of defense. They will not hesitate to drop very deep if necessary and break with speed once the Mexican attack is contained. Cameroon played a high defensive line in all of its pre-World Cup warm-up matches. The idea is to keep the opposing attackers closer to the midfield than in the Lions’ danger area. The disadvantage though, is that if the defenders are not tactically disciplined or one member loses concentration, the impact can be devastating. How they manage to switch-on immediately the game starts in each half; and their This, concentration at the end of the halves, are points to watch. These have been the team’s weaknesses in the recent past. As much as Cameroon will depend on counter-attacks, Mexico must also be wary of the Lions’ passing game forged by coach Finke. It is an interesting blend reminiscent of the 1990 generation that reached the quarter-finals. The player profiles and tactics are similar and they may stun Mexico as they did Diego Maradona’s Argentina. In 1990, Cameroon often started in a 4-5-1 formation. Emmanuel Kunde sat in front of the back 4. He intercepted attacks but also had the vision to make forward passes. In the current team, that role has been handed to Alex Song, who not only wears the number six jersey like Kunde but also has the ability to play in central defence and in midfield. Should Song be unable to start, Joel Matip would step into the Kunde shoes. Two other players supported gave the midfield steel and penetration in 1990: Emile Mbouh and Andre Kana Biyick. The former was the grafter – who would stop at nothing to get the ball, with an ability to play an energetic game for 90 -minutes. That role in the current squad is held by Eyong Enoh Takang. He is the one player who has started and completed every game since Volker Finke took over in May 2013. His is an ungrateful task of fixing the errors of his teammates without looking like the hero. Cameroon’s success depends on him being on song. The Kana Biyick role will surely be handed to Stephane Mbia. Kana Biyick could play almost anywhere. He was a good centre-back but hated to play in that position. He could play as a box-to-box midfielder in a double pivot but could also feature as a support striker when called upon to do so. Since he got into Cameroon’s senior squad, Stephane Mbia has played as right-back, centre-back, holding midfielder, relay midfielder and support striker. Down the flanks in 1990, Cameroon had two of its greatest artistes: Louis Paul Mfede (on the left) and Cyrille Makanaky (on the right). Both could also play as traditional number 10s or support striker if given the opportunity. Eric Maxim Choupo-Moting will be the current team’s Mfede. A great dribbler who can pass well and score goals. He will keep opposing full-backs in their camp. Cameroon’s success against Mexico and Croatia will depend on his form. Benjamin Moukandjo has dreadlocks like Makanaky and he also has the pace and tenacity of the 1990 hero. As observed against Germany, Moukandjo can defend and storm forward like a speed train. He also misses a lot of goals like Makanaky – who rarely scored for Cameroon. Cameroon in 1990 started games with a single out and out forward: Omam Biyick. He scored only one goal in that competition but it was an unforgetable goal (against Argentina). Omam, like Samuel Eto’o today, knew how to create openings for other forwards. Many often judged him in relation to the goals he scored (like they do with Eto’o) but it was his creativity that was one of his biggest assets. Each time the Indomitable Lions qualify for a tournament, Cameroonian singers and musicians get to work composing songs to the glory of the team. 1. Cameroun Wake Up – Co-written and performed by Conti Billong and Imke Mueller; featuring Manu Dibango: There’s a touch of Makossa as well as Jazz and funk to this tune. It is one of my favourites. 2. On Va Gagner (We’re Going to Win) by Armand Laklass : is a hot Makossa/Couper Decaller fusion. The sort of song that will get people dancing in clubs across Cameroon but also in other parts of West/Central Africa. 3. Venez Celebrer (let’s party/celebrate) by The 4 : captures the current spirit of popular music by young Cameroonians . It’s a blend of hip hop and local beats sung in French, English, Pidgin English and Camfranglais. This gives a flavour of the country’s linguistic diversity. 4. Allez Les Lions (Go Lions) by Askia featuring J Milly: also draws from what youngsters enjoy listening to. 5. In the Game by Duc Z featuring Stanley Enow : Produced by Orange mobile phone network which is one of the ‘Top Sponsors’ of the Indomitable Lions. Beyond the subtle marketing objective, it is worth listening to; especially as it features one of Cameroon’s top hip hop/rap talents of the moment: Stanley Enow. 6. Pala Pala by Bikutsi songstress Mani Bella isn’t really a football song. However soccer fans have taken to the song’s beats to produce a video to celebrate the Indomitable Lions. There are several more songs that I couldn’t feature in this list. The question that comes to mind, though, is what happens after the competition. There are some songs to the glory of the Indomitable Lions that have stood the test of time. One of them is Marie Arcangello’s Allez Allez Les Lions (it’s English version is Forward Forward Lions) released in 1990 ahead of the World Cup in Italy. It has basically become an anthem that is played just before National Anthem each time the Indomitable Lions play at the Yaounde stadium. But most of the songs disappear especially after a poor showing by the team. Does anyone remember “Lions Indomptable” by Patou Bass in 2010? Maybe these artistes should wait until the tournament is over to release a song. That way, if it is a successful campaign their song will remembered forever. For instance, I continue to hear Pepe Kalle’s ‘Roger Milla’ played on radio stations and at parties around South Sudan. The song was an ode to the Lions by a Congolese artiste after the team reached the quarter finals of the World Cup in 1990. It was supposed to be a day of celebration. June 8, exactly 24 years to the day when Cameroon scored a memorable victory against Argentina the then holders of the World Cup. Phone companies and local sports officials had planned to ‘triumphantly’ lead the new pride of Indomitable Lions to the plane that was to take them to the World Cup in Brazil. Well, the squad didn’t turn up. They refused to fly to Brazil until a row over match bonuses was resolved. They only left the country around 5:45 in the morning of 9 June. Haven’t we heard this before? Cameroon sports officials and players not in agreement over bonuses before or during a FIFA World Cup. Even that famous victory over Argentina in Italia 1990 (which sparked a historic run to the quarter-finals) was obtained amid disputes over match bonuses between the players and authorities from Cameroon’s sports ministry and the football federation. “[Bonuses were] discussed until the eve of the opening match (against Argentina),” said Bertin Ebwelle, Cameroon’s left-back at the tournament in Italy. “I can assure you that the discussions were rough and it wasn’t until 5 a.m. that the last player received his bonus,” he told Camfoot.com recently. Four years later, the players spent sleepless nights arguing over bonuses and the Lions crashed out of the competition after suffering heavy defeats in the hands of Brazil (3-0) and Russia (6-1). Yet, Cameroon did not learn. In 2002, possibly the best Indomitable Lions squad since 1990 refused to board the flight that was supposed to take them to Japan for the World Cup except a row over bonuses was resolved. They ended up staying for days at an airport hotel and arrived behind schedule. The Indomitable Lions, then African Champions, were bundled out of the World Cup after a 1-1 draw with Ireland, a 1-0 win over Saudi Arabia and a 2-0 defeat to Germany. Fast-forward to 2014. Cameroon had just started their pre-World Cup training camp in Austria when media reports suggested the players were locked in a row with the country’s football authorities over bonuses. Both sides sought to downplay the seriousness of the issue until it boiled over on Sunday. After the ‘industrial action’ by the players the federation announced in a statement that the issue had been settled, claiming that they had to draw from private loans to get the money to the players. Really?! This team qualified for the World Cup in November 2013. Both the authorities and the players know the history surrounding bonuses. What were they doing in the past 6 months? Why must every participation at the World Cup turn into a farce over something that could be agreed months earlier? Officials blame the players for asking too much and insisting on being paid before delivering a service. They think the players are going to ‘unpatriotic’ lengths (i.e. refusing to play matches or fail to board a flight) to negotiate their demands. There are conspiracy theories in the media that these demands are linked to internal politicking with some players trying to bring down the federation. Some in the media have questioned why a team that has not won any major tournament in the last decade should be making such high claims for match bonuses. Others have asked if the players will refund the money taken in advance, if they crash out of the tournament. Many wonder why the government should be paying footballers close to FCFA 50 million each in a country where swathes of the population go without clean drinking water or electricity? Whatever the case, this bonus saga is a complete disgrace for the players, the officials and the country. “This issue has to be resolved once and for all,” Ebwelle said. That way, players know from the qualifiers what they are going to earn at the World Cup… that way a player can decide whether he wants to go to the World Cup or not. If he decides to go, then he accepts what the nation offers him,” he added. According to Jules Denis Onana, another 1990 World Cup veteran, negotiations over match bonuses in Cameroon are always tense due to the mistrust between the two involved parties, especially as the players increasingly feel officials use funds that accrue from tournaments to line their pockets instead of investing the money into the development of football in the country. “Negotiations will always be difficult where there is no trust,” Onana wrote in an open piece published on Cameroon-footbuzz.com. “All that is needed to ensure that footballers and officials can negotiate in a peaceful climate, is a little more transparency around the source, allocation, and use of funds,” the former centre-back, now turned player agent, said. Cameroon’s Indomitable Lions defeated Moldova 1-0 in Yaounde in their final pre-World Cup friendly, which also served as an opportunity for fans to bid ‘farewell’ to the squad that leaves the country on Sunday for Brazil. Edgar Salli scored Cameroon’s goal at the 30th minute of the match following a cross from the right flank by the talented Benjamin Moukandjo. There was little else to write home about the game in which the Cameroon players were clearly under instruction not to over commit, in order to avoid last minute injuries. The Indomitable Lions ‘traditionally’ play an exhibition game where the 23-man squad is divided into two camps for a show, ostensibly to allow the fans say farewell and bless the team. This year officials of the football federation decided to organise an international friendly instead. Head coach Volker Finke rested the team captain, Samuel Eto’o, as well as Eric-Maxim Choupo-Moting, the most prolific scorer since they started preparing for the World Cup last May. However, the German trainer started Aurelien Chedjou, who had been carrying an injury thus missing Cameroon’s previous warm up matches. Chedjou was paired with Nicolas N’Koulou at the centre of defence. Henri Bedimo started at left-back while Allan Nyom got the nod as right-back. The latter missed a sitter towards the end of the game drawing scorn and catcalls from fans who were at the Ahmadou Ahidjo Stadium. Alex Song anchored midfield alongside Enoh Eyong and Landry N’guemo but the energy and harrying displayed in the game against Germany (in which this trio featured together in the 2nd half) was absent. There were numerous substitutions but this didn’t change the game whose flow was seriously hampered by the poor turf that gave an awkward bounce to the ball. Moldova camped in their half of the field for most of the contest. They stepped up in the second half and came close to an unexpected equaliser from a well taken free-kick in the final minutes of the game. After Cameroon’s 2-2 draw with Germany in a friendly, Volker Finke, the head coach of the Indomitable Lions, has named the 23 players to defend the country’s colours at the soccer World Cup that kicks-off in Brazil next week. Two players – Cedric Djeugoue and Loic Feudjou – who play in the Cameroon’s top league are included in the squad. Two other youngsters: Swiss-based Fabrice Olinga and and France-based Edgar Salli make it to Brazil. Goalkeeper Ndy Assembe, defenders Jean-Armel Kana Biyick and Gaetan Bong; as well as midfielder Raoul Loe and attacker Mohammadou Idrissou were left out by the German trainer. If fans generally expected that Idrissou and Loe would not be part of the final squad to fly to Brazil, it wasn’t so clear for the three others. Assembe, who was at the last World Cup, appeared to be the second choice keeper behind Charles Itandje but the coach preferred Loic Feudjou and Samy Ndjock as back-up goalies. Guy-Armel Kana Biyick, the son of Andre Kana Biyick who played for Cameroon in the 1990 World Cup, seems to have lost his place due to a niggling injury that he carried throughout the training camp in Austria. Although it must also be said that the France-based player had lost his spot as Nicolas N’Koulou’s partner in the centre of defence since Finke took over in May 2013. The German often paired N’koulou and Aurelien Chedjou; and N’Koulou and Joel Matip in the last two games. There were 3 candidates (Benoit Assou-Ekotto, Henri Bedimo and Gaetan Bong) for just 2 spots as left-back. Bong, who was at the World Cup in 2010, lost out to the man whose place he took four years ago. At the time, coach Paul Leguen surprisingly left out Bedimo who had been part of the qualifiers and played the Africa Cup of Nations in Angola. Bedimo has had a great season at Lyon in France while Assou-Ekotto is quite an experienced hand in that position.